Ginger is a familiar spice made from the underground stem, or rhizome, of the Zingiber officinale plant. Ginger juice, prepared from pieces of fresh ginger rhizome, has a number of medicinal properties that make it potentially useful to calm an upset stomach, as an anti-inflammatory agent and to lessen your risk for cancer. Talk to your doctor about ginger juice before adding it to your regular regimen. Ginger in its various forms has been part of herbal medicine in Asian and Arabic cultures for thousands of years. Fresh ginger juice contains a number of natural compounds with medicinal qualities, including several chemicals responsible for ginger's pungent flavor. These natural chemicals, called oleoresins, include gingerol, shogaol, zingerone and several volatile oils, which are responsible for many of its medicinal properties. Compounds in ginger juice reduce nausea and vomiting caused by motion sickness, pregnancy or following treatment with chemotherapy medications. Several clinical research studies support the usefulness of ginger in preventing nausea and general stomach upset. In a study published in the "Critical Reviews in Food Science and Nutrition" in 2013, the authors reviewed several studies and concluded that ginger is helpful in preventing nausea and vomiting. 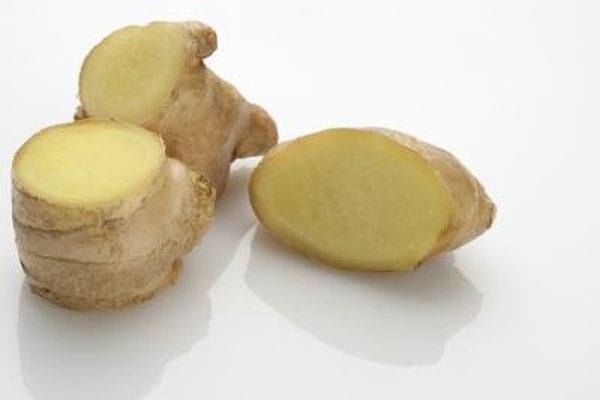 Ginger might also help with nausea associated with chemotherapy, but the review points out that the evidence is mixed. Ginger juice may also help reduce inflammation caused by colitis, arthritis and other conditions. A number of research studies support use of ginger to relieve pain resulting from inflammation. In one of these, published in "Arthritis and Rheumatism" in 2001, human subjects with knee arthritis took either ginger or a placebo for six weeks. The group that consumed ginger experienced a significant reduction in knee pain compared to subjects who took the placebo. An additional study, published the "Journal of Alternative and Complementary Medicine" in 2013, found that ginger can relieve the side effects of medication taken for osteoarthritis. Ginger juice may also reduce your risk of developing cancer or help improve the outcome if you already have the disease. Memorial Sloan-Kettering Cancer Center summarizes the findings of several research studies that suggest compounds in ginger inhibit growth in the laboratory of cultured ovarian, colon and stomach cancer cells. These results are promising, although clinical trials with ginger and human subjects are still needed. You can prepare ginger juice from fresh ginger roots by peeling several root segments, grating them into fine pieces and pressing the pieces through cheesecloth, allowing the juice to drain into a container. Alternatively, put fresh ginger pieces through an automatic juicer. Add a small amount of ginger juice to honey or another juice, such as carrot or orange, to make the pungent taste more palatable. Consult your doctor to decide whether ginger juice might be helpful for your condition. Journal of Alternative and Complementary Medicine: Influence of a Specific Ginger Combination on Gastropathy Conditions in Patients with Osteoarthritis of the Knee or Hip. Critical Reviews in Food Science and Nutrition: Ginger in the Prevention of Nausea and Vomiting: A Review.